Looking at old census records is fascinating. I grew up hearing stories about poverty during the Great Depression. But my mother’s family was clearly bourgeois and not working class. They purchased this newly constructed house during the Great Depression. So why would my mother and grandmother mask their bourgeois class origins and exaggerate their poverty (and I understand that everybody had it bad during the Depression). 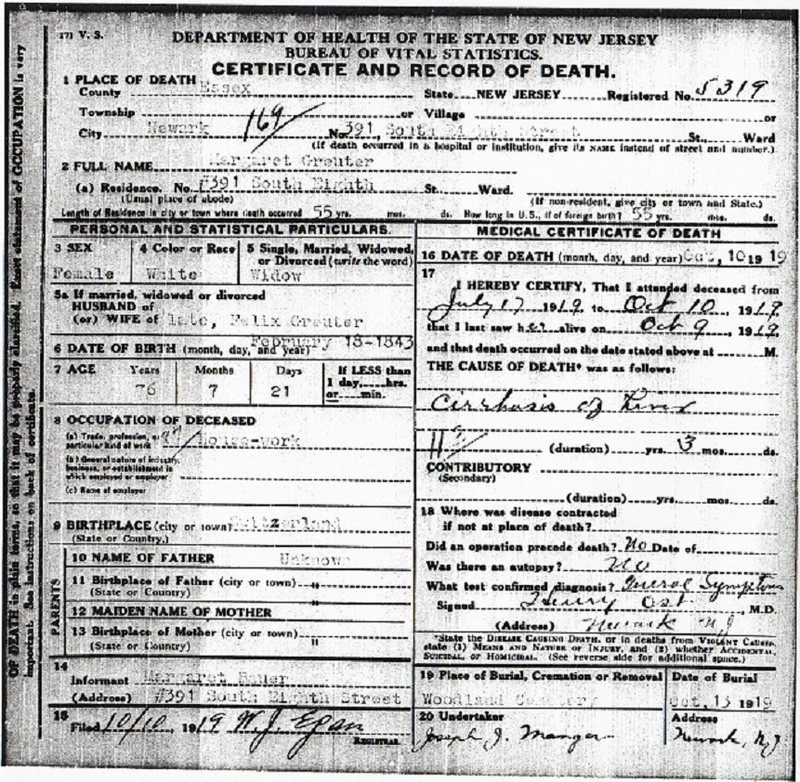 Perhaps it’s my great grandmother Margaret Surbeck Greuter, who traveled from the beautiful city of Schauffhausen in that most fortunate country of Switzerland only to drink herself to death in Newark, New Jersey. Poverty in New Deal America (you’re too young to remember it millennials) was not necessarily noble. But it was part of the American story. Drinking yourself to death was a bit too personal. It’s quite clear why she died in her early 50s. My mother was well into her 30s when I was born. It seems her mother was too. My great grandmother was in her late 20s and married a man over 50. Perhaps it explains my own sexless, passionless reality. I am the child of puritanical German petty bourgeoisie terrified of losing control and drifting into the bottle and an early death by cirrhosis of the liver. I am the opposite of Charlotte Gainsbourg. She was conceived during the recording of this song. Maybe it was why she made such a good Jane Eyre (in the underappreciated 1990s film). Charlotte Gainsbourg and William Hurt are passionate and sexual but not pretty. Mia Wasikowska and Michael Fassbender are pretty but sexless. Their scenes remind of of an English Professor hitting on one of his students. She’s enjoying the control she has over him but is slightly grossed out by it. But I like sexless middle brow films. I’m a sexless middle brow descendant of sexless middlebrow German petty bourgeoisie. My father’s family is authentically proletarian but that’s another story. Maybe if my mother had had a drink once in awhile her life would have been more fulfilled. ← I wonder how lucky Snowden feels now that he never made it to Ecuador?